The West Rib is a step down in difficulty from its neighboring Cassin, but it is substantially harder than the West Buttress route. This is a huge direct line for those climbers wishing to push their limits a little more but still stay in proximity to the core climbing area and network of West Buttress route. 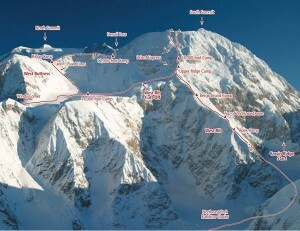 While the technical difficulties of the route are minimal, the sustained nature and virtue of being on the south face of Denali make the climb daunting. It also requires climbers to enter the dangerous Northeast Fork of the Kahiltna, a.k.a. the Valley of Death, but once this is passed, a pure 9,000-foot ridge-climb awaits. Which SuperTopo guidebooks include a topo for West Rib?